Dr. Diwakar Pokhriyal has completed his Ph.D. in Energy Management, P.G., and B.Tech in Power. 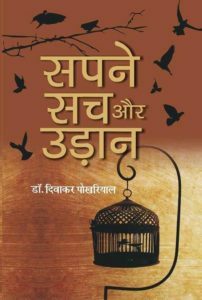 He has written 1 Hindi novel, 14 poetry books and 1 short story collection which is published. He is a part of 100+ poetry anthologies/magazine with poets around the world. He has been entered into ‘Limca Book of Records 2017’ for his books Poetry for Everyone 1 and 2. He has won “Aagaman – Yuva Pratibha Samman 2015” (Young Talent Award). He has also won “Poiesis Award for Excellence in Literature – 2014” for his English short story by xpresspublication. He has participated in the Duet Poetry Anthology, a part of “Limca Book of Records – 2015”. He is also a rhythm guitarist. 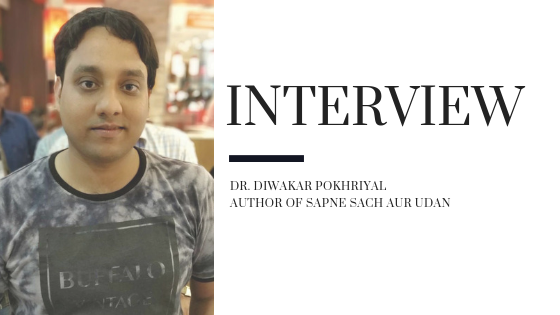 You can connect with him through his facebook page Diwakar Pokhriyal or in twitter @poetofsenses. Diwakar: I started scribbling poems and stories since 9th class but had no idea about the publishing world. Before publishing my first book, I had written dozens of poems and stories. Only when I was in my first year of Post Graduation, I decided to dive into the sea of Literature. I wanted to be a writer and wanted to write until eternity. Diwakar: The literary world is very vast and it includes various art and craft. With the advent of the internet, it has been easy and at the same time difficult for the writers. It has become easy to find a publisher, but difficult to make it to the readers. This world consists of creativity and has the potential to change the world for good. I expect readers to read and express their views on the new and established writer instead of selected writers. Diwakar: Marketing plays a major role in the promotion of a creative piece of work. It improves the visibility if the book as well as the writer. It creates the required anxiety and temptation about the book amongst the reader and encourages them to read it. Quality of the book makes a reader to grab another book from the same reader. It tests the long life of the book as well as the writer. Quality basically ties the expectation of the readers from the writers next or upcoming book. Diwakar: I want to spread the message that ‘Dreams comes true with determination and team-work’. The story of the Novel revolves around this. This novel also shows the face of the society and how at times the young minds get distracted. I love to spread positivity while showcasing the real problems we are facing around us. This gives us hope and makes us Stronger. In my stories I would love to add an element or situation that can have two solutions and how different decision can breed different results. The major message should be that we should keep ourself away from Judgement and keep faith in actions. Diwakar: I work as Technical Head – Solar and Energy Projects in Asmi Energy Systems Private Limited, Mumbai. We install Solar Power Plants in the residential societies, commercial complexes, industries schools, and colleges. We also conduct the seminar for the awareness of Solar Energy among people and has Started Solar Certification courses for college students. Energy field has a large scope for jobs and we are working towards the same as a corporate. Diwakar: I have not faced the writer’s block yet. Yet I have heard a lot regarding the same. I love to write and if possible would love to write the whole day. As I write poetry ranging from 2 lines to 100 lines, even a simple though I would love to convert into a poetry. After writing my books ‘Poetry for Everyone 1 and 2’ I have realized that there is numerous form of poetry and we can experiment with new forms too, which has suddenly become so exciting that I have tried few new forms of poetry in the same book. I would certainly love to answer this question if I will face the block in the future. Diwakar: It would be a dream for me at this point in time if the story written by me would be adopted as a movie. For any writer, this is indeed a moment of bliss that he cherishes for his whole life. I would love to work as a director because I believe that would do justice with the story or it would keep intact the message I would like to come out of the movie. I would rather love to give the movie a few more twists and turns as given in the novel. Diwakar: I would love to keep writing. I am planning to write Novels for next 4-5 years and then would take things from there. As poetry is an integral part of me, I believe I would keep scribbling poetry till I am writing. As I am also working in a corporation that makes difficult to devote a lot of time for writing and this makes difficult to produce stories on a regular interval. So for the near future, I would certainly write Novel as I am currently working on my first English Novel, which will hopefull would get completed in 2019 and then would love to see what would I write next. Diwakar: Keep writing and Keep reading. This is the only thing I would like to suggest to the writers. Keep clear goal in your mind regarding writing. People often get’s confused between writing and selling books. The writer should have a clear goal about his/her writing. Because once the goals are set, I actions becomes easy. The goal-setting eliminated the doubt and confusion. So keep reading, keep writing and keep setting goals regarding your writing.